Three islands are observed from the air—the blue and white sea radiates outward from them as the underwater reefs surrounding the islands allow us to visually penetrate the clear water. 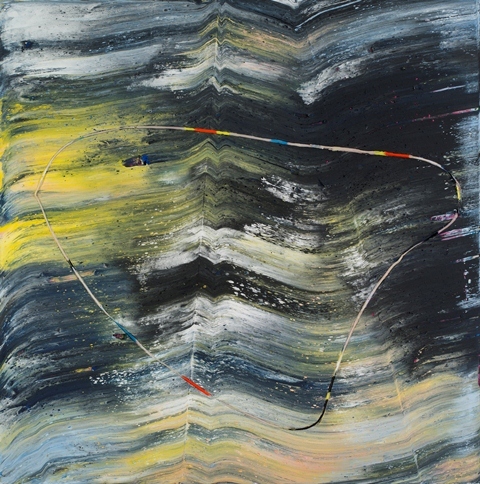 Jack Whitten’s Zeitgeist Traps for Michael Goldberg (2009) is not a landscape, or a abstraction of the Greek Islands off Crete, where Whitten has spent every summer since 1968. 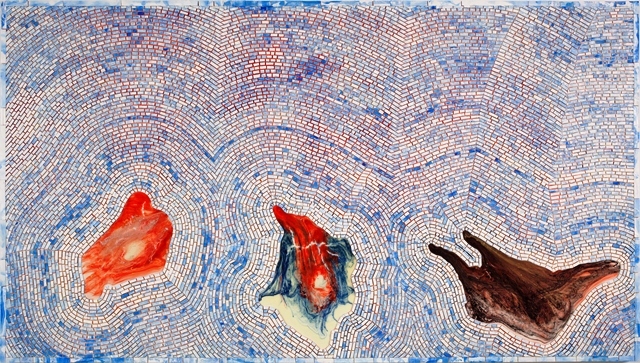 Zeitgeist Traps for Michael Goldberg (2009), part of Jack Whitten: Five Decades of Painting, isn’t a map; the work instead functions more as an abstract collaged homage to Michael Goldberg, an New York abstract expressionist with whom Whitten would have interacted after moving to New York in 1960. 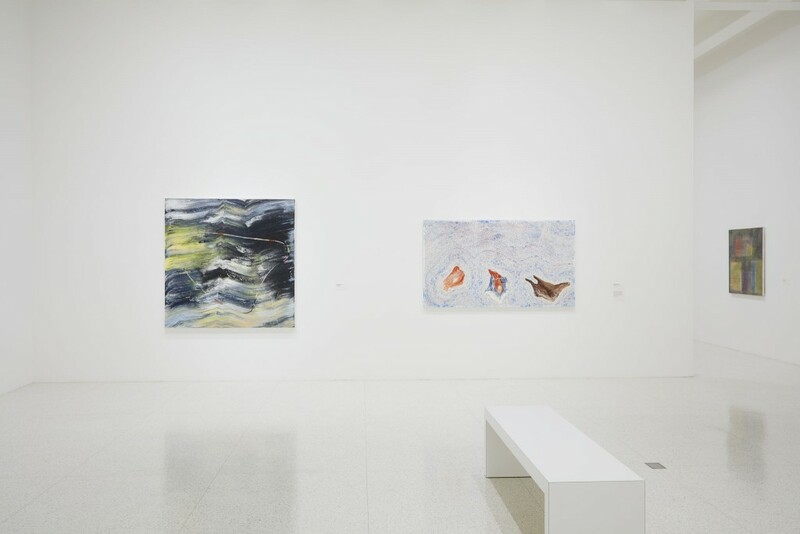 Whitten’s practice is one best examined through the lens of his own conversations and experiences, an acknowledgement to the communities in which he belonged and the artists, musicians, writers and thinkers who had an affect on his own life and work. The artist’s “Black Monolith” series—each painting dedicated to black artists who had influenced him, including Miles Davis ,Duke Ellington, and Romare Bearden—began in the 1980s and expanded to a practice of creating monuments for seminal figures including Marcia Tucker, Christopher Wilmarth, and Clement Greenberg. Whitten knew these figures intimately; they were his friends, peers, colleagues, the network that surrounded his practice. Goldberg has been recognized as one of quintessential New York abstract expressionists. Born in the Bronx, he grew involved in the painting community taking root on Manhattan’s Lower East Side, after studying at the Arts Student’s League as a teenager. When Whitten arrived in New York in 1960, Goldberg would have already developed his practice and would have already been a fixture at the School of the Visual Arts. Although neither artist have talked explicitly about the other’s influence of effect, they would have belonged to the same circles, having conversations with an enclave of painters including Jackson Pollock and Willem de Kooning (who was especially influential and a mentoring presence for Whitten). Both painters’ practices shared a lineage from Hans Hoffman, who had taught both men briefly and whose iconic “push pull” of paint translated into variations on the square in both Whitten’s tesserae and Goldberg’s recurring grid-like abstractions. The men both shared a love for and deep understanding of jazz and were ultimately drawn to the Mediterranean: Goldberg would return time and again to the campagna of Tuscany, while Whitten split his time between New York and Crete. 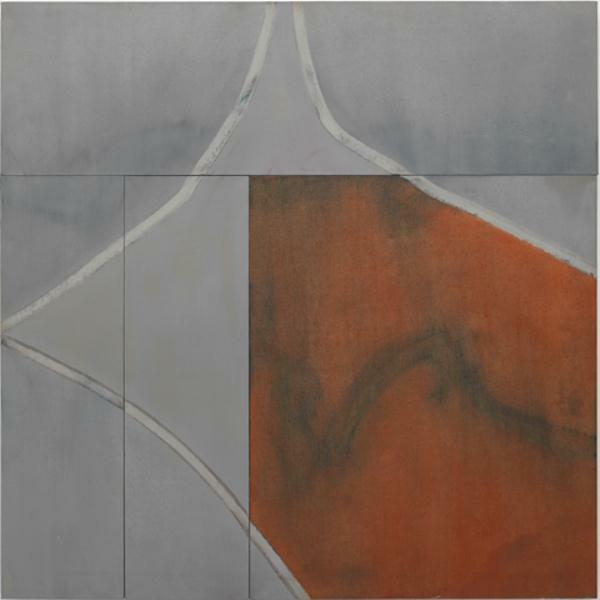 Early June (1968), a quintessentially Goldberg painting, has been in the Walker’s collection since 1985. By 1968, Goldberg had already been working in Mark Rothko’s studio for five years, and Whitten had begun using the transformer in his painting, a major turning point in his practice, and had visited Crete for the first time. It was an important year, for art, for politics, for life. Composed of four separate canvases, Early June is a whole of parts, pushing paint across the separate canvases to create a united image. The architectural underpinnings of the graphic lines are supported by the physical construction of the painting’s frame. Goldberg, like Whitten, was pushing paint to do what it wasn’t always expected to do while embracing it for what it does do. Early Spring‘s geometric formalism is broken but the open side of the loose form activates the composition, in much the same way as Whitten’s use of the “fisherman’s net,” a repeated icon in his work including Warped Circle (Alan Shield) (2013). Around 2010, Whitten began the process of casting acrylic. He had already begun thinking of paint of having the ability to possess a sculptural form: since the 1980s he’d been casting paint into a grid of tesserae which were collected and applied as individual tiles on the paining’s surface. Expanding beyond the systematic process and creating, and fairly uniform appearance of these tesserae, Whitten began to cast common objects from studio, a water bottle, a shoe, a plastic container from a hearing aid. The cast molds are filled with paint, resulting in the colorful, abstract forms that were, like the tiles, attached to the painting’s surface, forming what Whitten calls “apps” or “islands.” These colorful forms, are in some ways, photographic evidence of Whitten’s daily experience. He terms them “ready nows” as a nod to the Duchampian Readymades. In Zeitgeist Traps for Michael Goldberg, created two years after Goldberg’s death in 2007, these “islands,” or “traps,” aren’t only objects, they are forces, radiating towards each other on the plane. The “traps” each created from mixtures and pourings of different colored paints in the molds are complex, weighty objects, land masses, or personalities. Their traps are insular yet exude physical presence, spreading the white ripples outward, dispersing, blending into the sea. Their relation, sharing space on the plane, seems to create an active, living moment. Whitten’s zeitgeist isn’t just the spirit of the times. It isn’t a spirit fixed in one generation or one place, but a continued cross-cultural, cross-generational, cross-medium exchange, concentric circles of conversation, a back and forth, a give and take, a musical call and response of Duke Ellington. Whitten’s “Zeitgeist traps” are like the catch-all folders on my computer desktops. Assemblages of inspiration, ideas, random objects that when pulled together don’t present a cohesive. Like jazz notes they are products of a temporal moment, they respond to a inspiration but are captured in a form, like a music note, a Readymade trap.